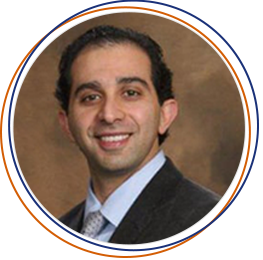 Dr. Alsheikh taught for three years as an Assistant professor in the Department of Ophthalmology at the University of Texas Medical Branch in Galveston. He taught young ophthalmologists about the fundamentals of Cataract and LASIK eye surgery. Dr. Alsheikh served as the Quality Care Committee Chairperson and the Director of the Ocular Surgical Simulation Program for the Department of Ophthalmology at UTMB. He continues to perform clinical research as a Clinical Research Professor at UTMB. He completed his medical school at Texas Tech Health Science Center, his ophthalmology residency at Oregon Health Science Center and his corneal fellowship at University of California San Diego. He feels fortunate to have met wonderful patients, colleagues and mentors in diverse regions of the United States and feels compelled to listen and learn from his patients here in San Antonio. His specific areas of expertise include Corneal Transplantation, LASIK Eye surgery, Ocular surface Reconstruction, Simple to Complex Cataract Surgery, Standard to Premium Lens Implants and Corneal Cross-linking. Dr. Alsheikh practices patient centered eye care and always makes patients’ needs and satisfaction his highest priority. He is focused on serving his patients, and hopes to achieve patient satisfaction level at the 95th percentile level. Dr. Alsheikh is currently working on multiple studies related to Complex Cataracts. He has previously participated in a FDA study related to ocular allergies. He is currently a Principal Investigator in a National FDA Multicenter Study that treats Presbyopia with Surgical Scleral Implants.